Kimbe Bay is a world-renowned scuba diving hotspot, supporting an incredibly diverse marine habitat - coral reefs, mangroves, seagrasses, deep ocean waters and seamounts. Over 900 species of fish have been identified here and the bay is home to 76% of the world’s coral species. The coral reef communities have remained largely undamaged by human activity and the area has become important for marine science research, with a long term conservation strategy in place to protect the precious environment. Whales, dolphins and sharks feed and breed in the bay's waters. World famous dives sites like South Emma, South Bay, Inglis Shoal, North Emma, Christine's, Susan's, and Restorf Island are only a few of the more than 200 reefs and dive sites sprinkled throughout Kimbe Bay. All are pristine and protected by a rigid policy of "Look but don't touch". 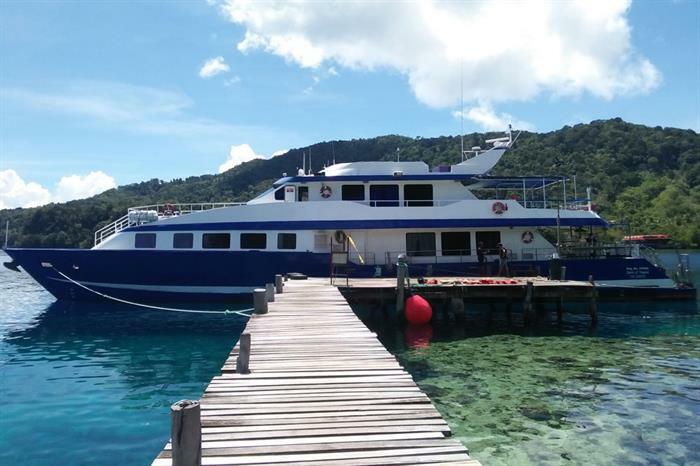 To dive Kimbe Bay, you can base yourself at the world renowned, Walindi Plantation Resort, or onboard the comfortable MV FeBrina liveaboard. West New Britain’s landscape is very diverse with high mountain ranges topping over 4,000 metres dividing the island of New Britain. Rainforest-covered volcanoes rising steeply to 2,000 metres out of the water line the bay providing a spectacular backdrop to the coral reef-fringed coastline and low-lying swampland. Four of the volcanoes are still active. Getting there: Hoskins Airport is a 90 minute flight from Port Moresby. Kimbe Bay is a suitable destination for both divers and non divers. Snorkeling, kayaking / canoeing, fishing, trips to bubbling mud pools, bat caves, WWII aircraft wrecks, Lake Dakataua (a dormant volcano crater), bushwalking, birdwatching, guided village tours, picnics at hot springs and cold rivers are some of the activities available. Kimbe Bay has a tropical climate with little seasonal variation. Temperatures range from 24ºC overnight to 34ºC during the day all year. The monsoon/wet season falls between December and April. Diving in Kimbe Bay is conducted on a year round basis. Water temperature ranges between 27ºC to 31ºC throughout the year. September to November and May to June normally has calm seas and the best visibility, whilst during the wet seas (January to March) the seas are also calm but visibility is lower. During July to August, the south-east trade winds can make seas a little choppy and visibility also drops. Visibility in the region normally ranges from 20 – 40 metres depending on the season. Kimbe Bay has some of the world’s most spectacular coral reef diving and sea mount / pinnacle diving. Pristine and colourful corals are home to a variety of fish, crustacean and invertebrate life. Many of the reefs have resident schools of barracuda, tuna and jacks. A range of shark species are regularly sighted, including hammerheads and silvertips, particularly on the offshore reefs. Large barrel sponges, brilliant red sea whips and gigantic gorgonian fans combined with large schools of fish and the bluest of blue water provide an abundance of photographic opportunities. Killer whales, dolphins and dugongs, down to the rarest nudibranch and tiny decorator crab, as well as most critters in between, are found in these waters. Giant sea fans dominate the sea-scape.This natural wonder is known as “Amphitheatre”. A volcanic pinnacle rising up from over 650m. Schools of big eyed jacks, barracuda, sea perch and surgeon fish dominate this dive. The waters around Restorf Island hold an incredible diversity of marine life. It would be possible to spend a week diving here and still find new things in the various habitat types around the island.